Our spacious king room comfortably accommodates two adults plus one child. Conveniences include complimentary WiFi, a flat-screen TV with cable channels, a microwave and refrigerator, personal climate control, a safe, and a balcony. The private bathroom is fitted with a hairdryer and complimentary toiletries. This spacious room is fitted with a kitchenette with kitchenware, and comfortably accommodates two adults plus one child. Additional conveniences include complimentary WiFi, a flat-screen TV with cable channels, a microwave and refrigerator, personal climate control, a safe, and a patio. The private bathroom is fitted with a hairdryer and complimentary toiletries. Our accessible king room with a kitchenette comfortably accommodates two adults plus one child, and is ideal for guests looking for a room with mobility features. This ground floor, non-smoking room is wheelchair accessible and is equipped with accessible features like a flat-screen closed captioning TV, a roll-in shower, and more. Additional comforts include complimentary WiFi, cable channels, a refrigerator and microwave, personal climate control, a safe, and a patio. The kitchenette provides kitchenware, and the private bathroom is fitted with a hairdryer and complimentary toiletries. Our room with two queen beds comfortably accommodates two adults. 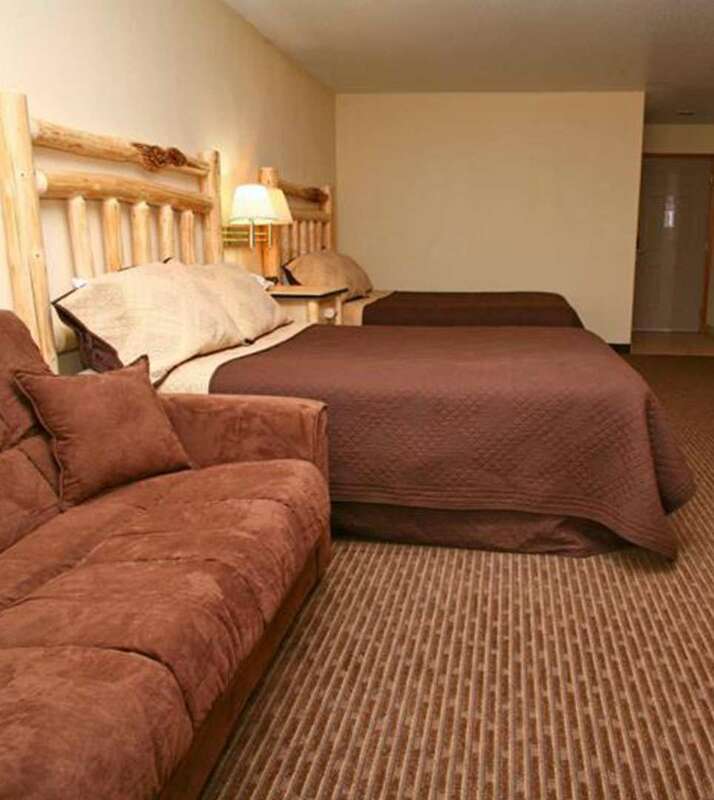 Conveniences include complimentary WiFi, a flat-screen TV with cable channels, a microwave and refrigerator, personal climate control, and a safe. The private bathroom is fitted with a hairdryer and complimentary toiletries. This accessible room features two queen beds and comfortably accommodates two adults plus one child. Our accessible 2 queen room is ideal for guests looking for mobility features. This ground floor, non-smoking room is wheelchair accessible and is equipped with accessible features like a flat-screen closed captioning TV, a roll-in shower, and more. Additional comforts include complimentary WiFi, cable channels, a refrigerator and microwave, personal climate control, and a safe. The private bathroom is fitted with a hairdryer and complimentary toiletries. Our pet-friendly room is fitted with two queen beds and even includes a special bed for your four-legged best friend and doggie treats! This well-appointed room comfortably accommodates up to four adults and includes complimentary WiFi, a flat-screen TV with cable channels, a microwave and refrigerator, personal climate control, and a safe. The private bathroom is fitted with a hairdryer and complimentary toiletries.